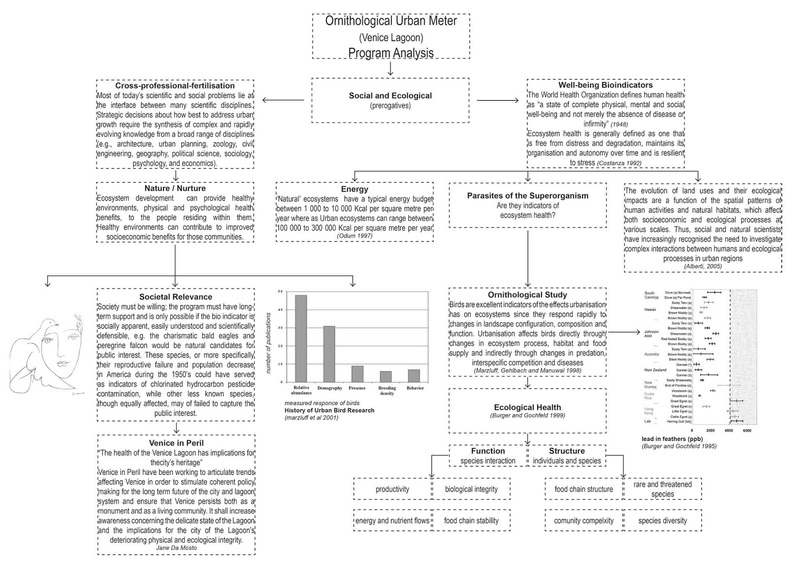 The program is fundamentally a response to the site, a relationship with the immediate location and an attitude towards the urban fabric. 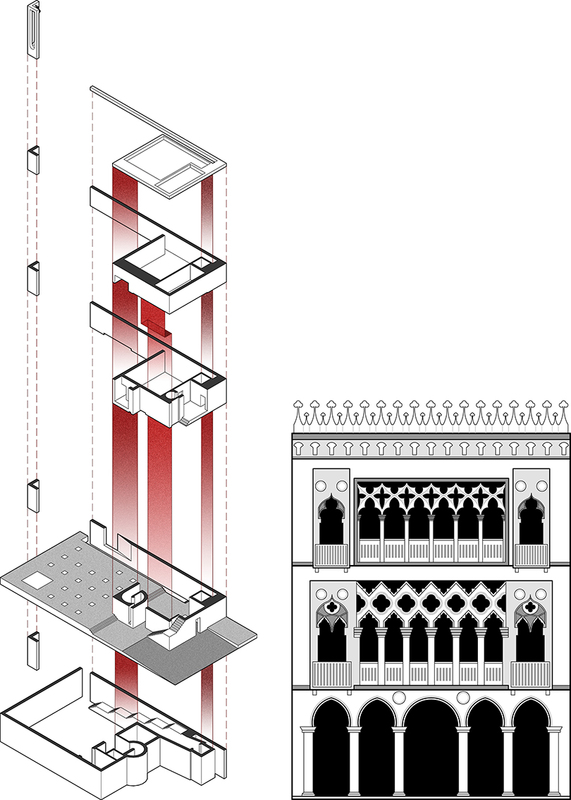 The building borrows from the Venetian typology of a Palazzo, a sequence of intimate spaces cumulating in a forum for organisations such as 'Venice In Peril' to discuss the city's ecological issues. 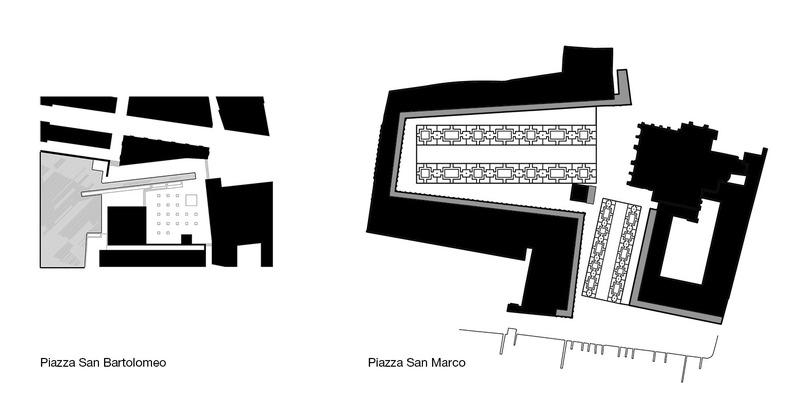 The programme also creates a new Piazzetta, an external public 'room' akin to the larger Piazza San Marco. A suspended metal ramp winds its way up the south façade of an adjoining Palazzo. It is screened by aluminium fins, hung with steel wires that twist in the wind. This forms one elevation of the 'Urban Room' while the West vista opens up to the Grand Canal and the ground plain dips into the water. These 'interventions' are inspired by the long and intricate Venetian culture of pattern and kinship with it's environment. The architecture of the building hopes to broadcast the ecological, social and cultural issues facing the city to tourist and resident alike. 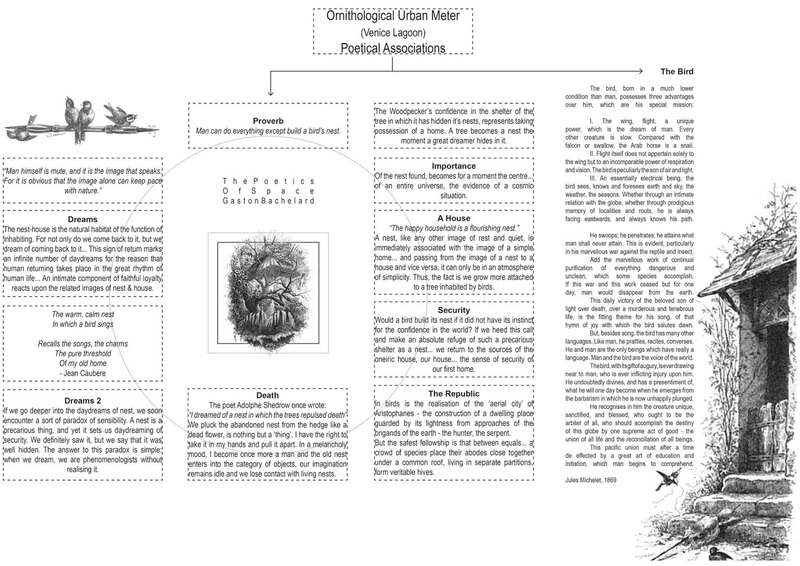 Intern, this encourages a cross-fertilisation of ideas to the widest demographic or in other words, an urban approach to crowd-sourcing the city's ecological agenda. An 'Urban Petri Dish' producing the best collaborative solutions needed for an exceptionally complex city. Directly North, the Office for Metropolitan Architecture will turn the Fondaco dei Tedeshi (the old German trading forum) into a cultural department store. Adjacently to the left of the site the Rialto Bridge crosses the Grand Canal connecting the island district of San Bartolomeo with the Rialto market, the historical trade centre of the city. A 3-minute walk to the South East is St Marks Square. Napoleon called it “the drawing room of Europe” and it is one of the greatest urban spaces in Europe. Re-ordered in the late 16th century by Jacopo Sansovino, he unified the square by cladding the front of all the buildings with a new façade and colonnade to an 'ordered' renaissance design that gave the square a coherent geometry while bending to the irregular shape of the historic buildings. 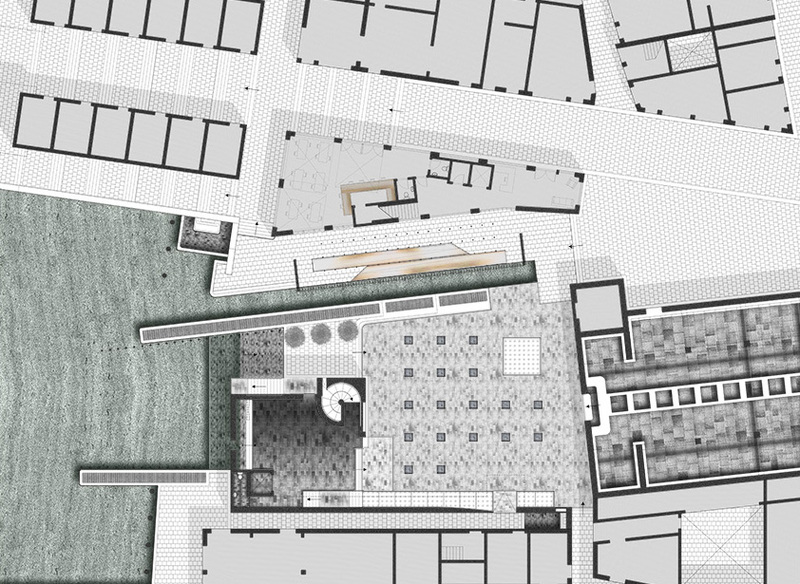 The proposal replaces the dilapidated Hotel Rialto with a new Piazzetta (The Urban Room), a small Palazzo (a sequence of internal rooms used for gathering and discussion) and a new route that integrates into the experience of the city. 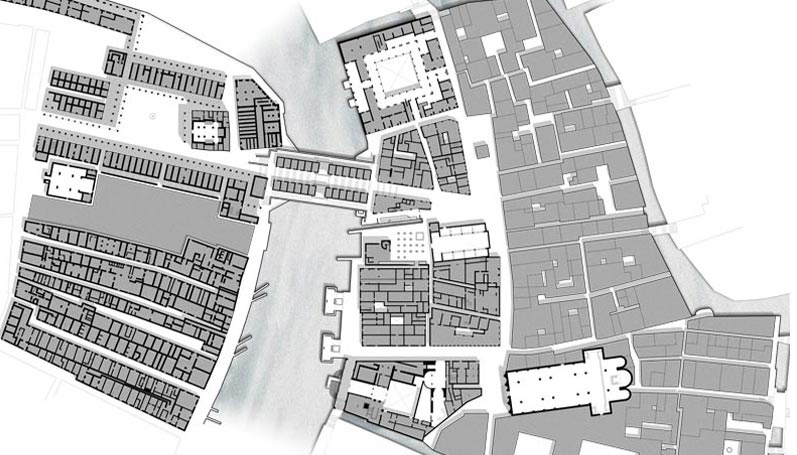 Clearing the site is an urbanistic move to reinstate the presence of one of Venice’s first churches, The Church of San Bartolomeo, that diminished as markets crowded around it. Where the Hotel has been removed, two new façades are created facing inward to the new Urban Room serving to define and offer something to the enjoyment of the space. Capped by the Palazzo building, the space feeds through to the Grand Canal, the Rialto Bridge and the market beyond. On a finer scale, the site mediates between the rise and fall of the water, the typography of the Rialto Bridge and stepping down through the levels, the light reflected from the Grand Canal and the noise of the crowds, starlings and bells of the city. A series of axes of the surrounding context culminates at this point each with a similar level of urban hierarchy that in turn pulls the building form and public space into shape. The City has an absolute and relative connection with the water. The servicing of the buildings, arrival and departure of people is by boat at a stop just south of the site. Gondolas line up beside the Rialto Bridge waiting for customers while motor boats speed underneath. However, during the acqua alta the water occasionally rises above the bank and people splash through the lanes and campos wearing wellies and on boarded walkways. 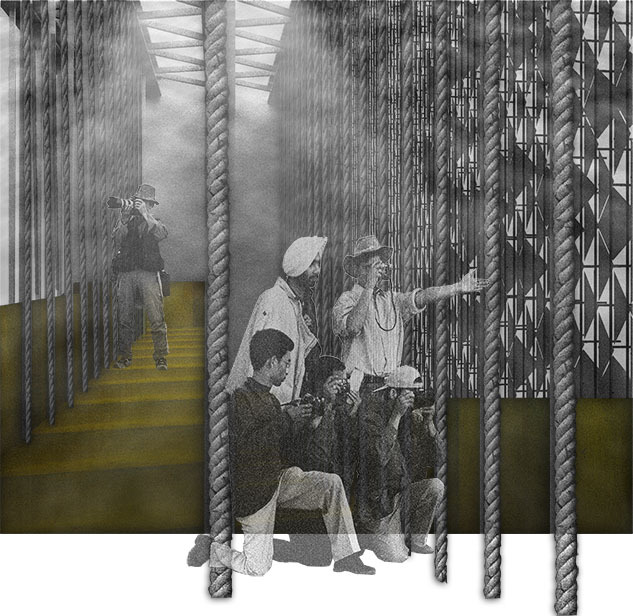 In contrast to the Urban Room, the structure for the ramped walkway is about lightness. 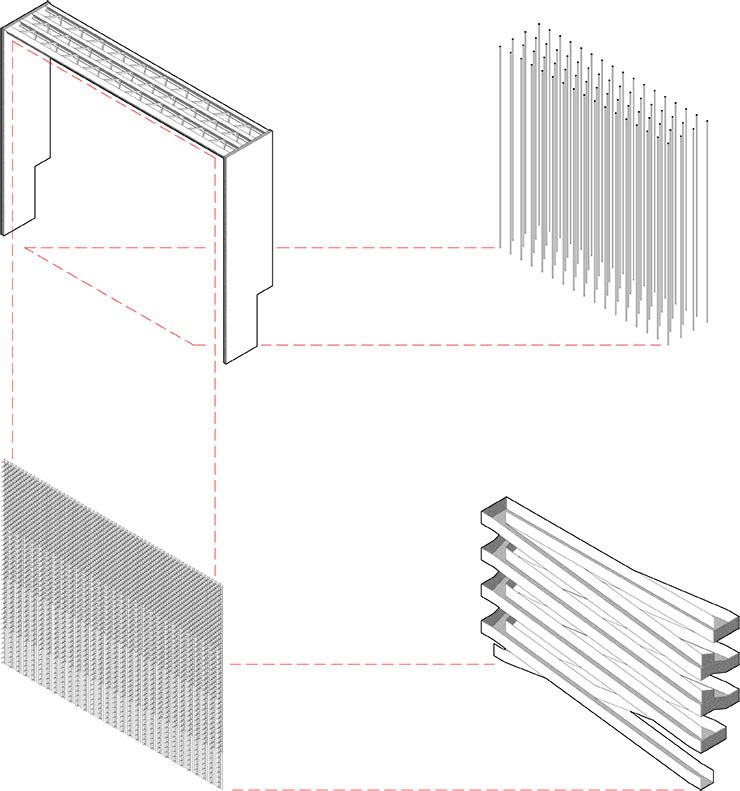 Two shear walls sit at either end of the ramps and steel trusses span between them. This forms a large portal framed structure that allows suspension cables to hold the ramps in the air. 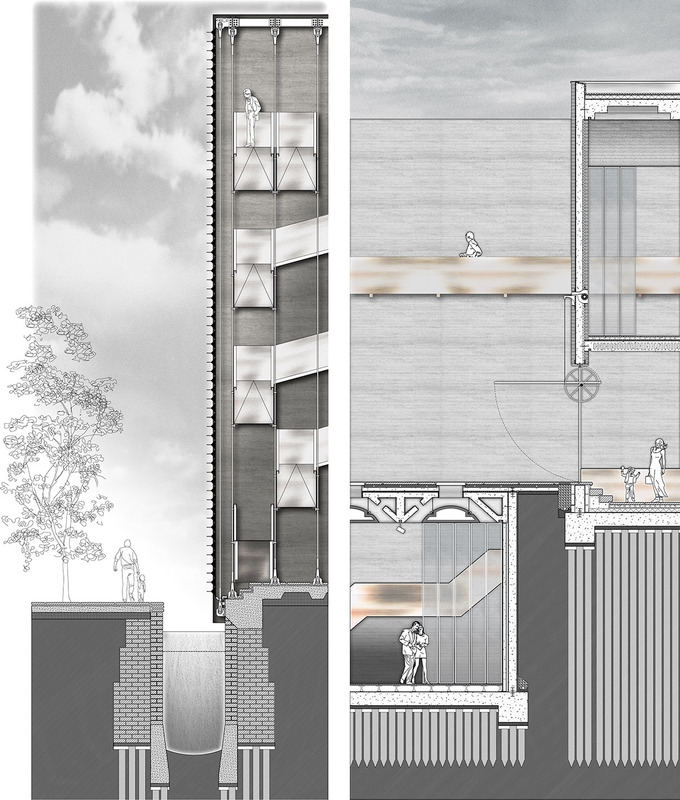 The route remains open to the elements as the exposed structure references a bridge more than a specific building typology. The structure plays a vital part in explaining the urbanistic move of connecting the aerial route with Venice’s numerous bridges while introducing an entirely new type of bridge, perhaps more akin to the campanile's. While drawing a comparison city’s other crossings, the aerial route is also inspired by the rigging found on the grand tall ships that would of to sail from the city to explore the world. The experience of Venice is formed from the array of spaces, patterns, noises, smells; and colours that together are unlike anywhere else. None-the-less one finds a continuality in style, form and proportion throughout the architecture. Venice is an organic city, evolved from a republican society desperate to find refuge on a series of islands in the lagoon. It developed a strong historical association with exploration, trade and the autocratic rule of the Doges. Strategic politics; Gothic decoration, eastern culture, renaissance intellectualism, and many other influences became the city's tapestry though which ornamentation, pattern, style and ideas where able to unify the idea of the city state.